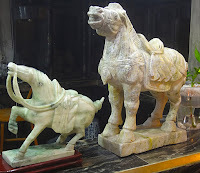 Old antique & vintage Jade carvings. Beside of all the big museum exhibiting all variants of jade stones e.g. 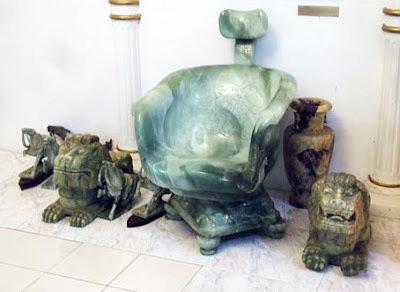 in Beijing and Shanghai there are interesting smaller ones with an impressive collection of antique jade items. 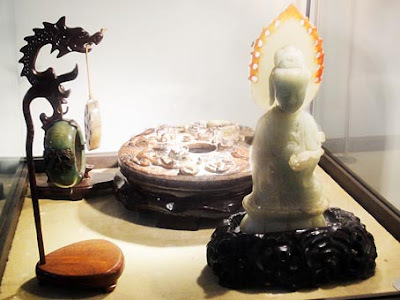 Here are vintage and antique jade attraction they look very pretty with different styling and colors have a look the ideal pretty things for an everyday environment. 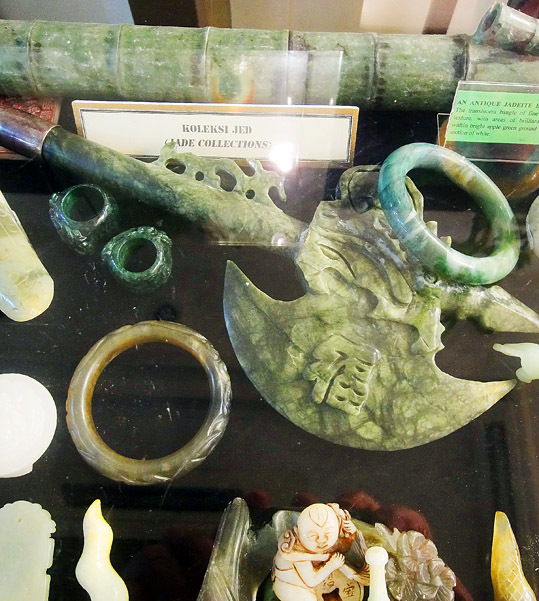 Everyone who visits KL and want to see fine jade carvings valuable and other pretty objects should have a look. The place is rather difficult to find a good start is at the backside of the Times Square Mall it's only a 15 minute walk through a quarter with small houses. If you get a map in the hotel and have it marked it should be no challenge to find. Beside of the beautiful items it also tells something about Chinese art and culture since all objects on display have their origin there, a possibility to have a closer idea. This small museum shouldn't be ignored because it’s a real treasure trove and a KL shopping attraction although if you are not a lover of the green stone, here is a clip about antique jade. 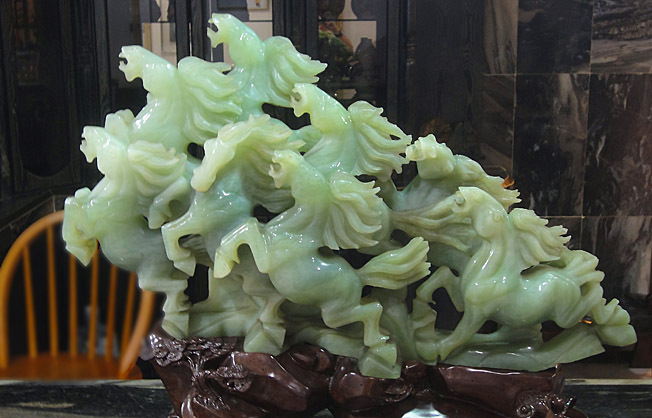 The stones, in this case mainly nephrite, are integrated into the culture over several thousands of years. 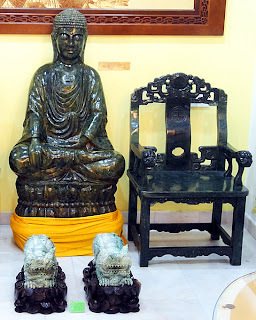 This is not the National Museum with plenty of Chinese goods, pottery and porcelain recovered from sunken ships, but the collection is very diverse, has a high value and is in good condition. There are hundreds of objects from very small up to a laughing Buddha sculpture of over one meter. This is the symbol of fun and happiness and regarded as one of the Chinese gods of wealth. 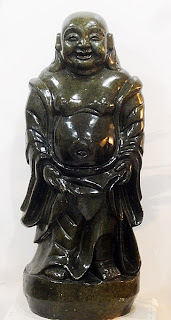 It symbolizes prosperity, wealth and luck that's one of the reasons why the sculpture is often used as decoration in a home. The location where the statue is placed is important. It should be placed around 30 cm above a surface and facing the main door, not for worshiping, only for display. Some are in standing position and some in the sitting position. 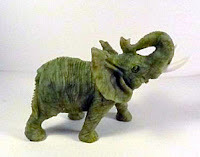 Ancient carvings often have changed colors which turn parts or the entire surface into a gray white and opaque shade. This process is called `calcification', although it has nothing to do with calcium or any. This could take place by changing temperature and humidity, lack of oxygen and other reasons. 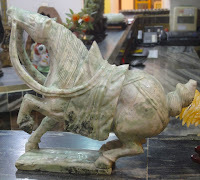 Here is another horse sculpture.